These Euro shams were just what I was after. Very nice quality, which is what you would expect from Eddie Bauer. Great deal as well, so you can't beat it! Feel comfortable and supported with these fluffy shame stuffers. Made with a blend of goose down and white goose feathers, these hypoallergenic sham stuffers provide soft and supple comfort that is great for people with allergies. Furthering their appeal, these sham stuffers are encased in a double-liner fabric that both controls the feathers and creates a clean look. ABSOLUTELY LOVE AND RECOMMEND THESE THICK PILLOWS! How anyone could give these any less than 5 stars is beyond me. These are THICK and FULL and plump and really wonderful. Yes, they have some feathers in them. They are not 100% down. I would not want 100% down Euro pillows. I need more body than that. The feathers give them body. I don't sleep on mine on a nightly basis because I bought them just for using to sit up and for decor. However I have fallen asleep on them and slept with them all night and they were very comfy. Maybe if you had really cheap thin shams the feathers MIGHT bother you, but I bought Ralph Lauren shams from Macy's and I don't feel the feathers at all. I almost did not get these because of the reviews from a couple people on here, but this is one of the best purchases I have made this year! I absolutely LOVE these pillows. They were completely plump about an hour after unpacking. Might not have even been that long. I highly recommend these pillows! Beautiful Snow White Euro pillow shams. Bought them to go with my Euro pillows. Quality is great. Super soft cotton. I wanted a quality feather down pillow that I could wash that wasn't too pricey. These Eddie Bauer euro pillows are perfect. They're plump, and do not flatten to nothing like some feather pillows do. They are on my sofa, and I love them. I highly recommend. 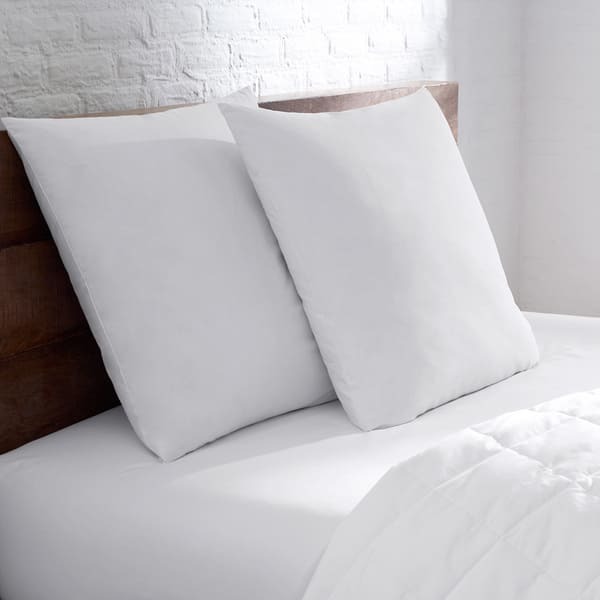 These are great Euro shams ... they fill out my euro sham cases nicely and make my bed look very nice! Great quality and price! Great product if you need a sham stuffer. Holds up nicely. We bought a bedding set for our new bedroom that included "Euro-shams." This required us to buy square pillows. I bought these based on reviews I read online, saying they kept their shape and offered good support. They do! When I read before bed, this is the pillow I use to support by back, in conjunction with my own bed pillow. The "karate-chop" we create when we make up the bed in the morning lasts all day. We are very pleased with them. I bought two of these Pillows and they are BEAUTIFUL! It took me months to finally purchase pillows online because if I didn't like them id have to pay big bucks to return them. So I took the risk and I LOVE THEM. They are amazing quality, VERY BIG and VERY FULL. You can somewhat feel the feathers in them, but it goes away with use. They are wonderful quality for the price. I just bought two more yesterday! Excellent quality Euro Sham Stuffers! I am very happy with them. They are all I could ever hope for in terms of quality. They are firm, they fill out the Euro Shams perfectly and they hold their form. They are just what I had hoped for. Thanks! These pillows were great at first but they did not hold up well. I except anything down or feather based to need some fluffing but these flatten pretty easily. There were also a lot of feathers that poke through. For comparison, I have a down pillow as a bed pillow and my current sofa has down and feather wrapped cushions. Of the three, these pillows have the most run away feathers. These are plump, dense pillows. They are medium firm and have enough structure to work well as a support if you are sitting up and reading in bed. Edit: I have now had them over 3 years and they are still as good as new. Purchased these for shams and they are nice and full. I have some others that are not as full as these. Love these - use them on my bed and they are great! These are true to size. They worked perfectly! They are not as firm as I like my down pillows, but, since they are mostly for the bed decor they will work. I ordered a set of these pillows and I am very happy with them. Comfortable and cozy. Nice quality. Comfortable on back of bed to lean on. Don't plan on sleeping on these so can't comment from that perspective. Works great for Euro shams. They hold their shape well and don’t have a weird smell. Perfect size for my application. Will buy again and recommend to my friends. I’m very happy with the pillow inserts. I use them to read in bed. They fill my shams nicely plus they’re very comfortable. I was hesitant to buy because I prefer down pillows but for this particular need they fit the bill better. I love Eddie Bauer bedding! "Will these fit 24x24 shams?" Hello gbryan54, thank you for your interest in the Eddie Bauer Luxury Euro 230-count Sham Stuffers (Set of 2). No, it will not fit shams that are 24 x 24. The dimensions for these stuffers are 26 inches x 26 inches. Thank you for shopping with us, and have a great day! "How thick are these pillows?" "What is the firmness of these pillows...soft, medium, or firm?" The pillow firmness is medium.